Ever tried oil pastels, pen, ink and watercolor wash or…winning an art ribbon at the Alaska State Fair? Paint a miniature masterpiece on a tile, or make a needle felted or soft pastel painting of your favorite animal! Block printing is a blast but maybe bead weaving is your thing? Make a tiny posable needle felted or beaded friend or learn to paint with watercolors! Welcome to The Art House! Betty Dye has offered fine art instruction at The Art House in Anchorage, Alaska since 1998. and has been teaching art since 1988. The Art House alternates classes in many different mediums for children from ages 8 – 12, teens and adults throughout the year. Learning to create art is a forever gift to give yourself or someone you love! Please contact me if you are interested in getting information about classes or to sign up. There are so many different mediums to try! See what students at The Art House have created! Lots of classes to choose from! Teens and adults welcome in all classes. Hover over photos in grid view to see more. Check out both list and grid views! Create a stained glass masterpiece with paint! This is a fun way to get some of the effect of real stained glass art but it is much simpler and less expensive than the real thing. In this class, after making an 8X10" design to work from as a pattern to follow, a sheet of glass was placed over the drawing and adhesive backed lead strips were placed on the lines and pressed down. The separate areas of the design were "flooded" with very fluid Vitrail glass paint which hardens within 24 hours. Depending on the complexity of the design, lots of fun things can happen within that paint while it is still wet. I made 3 large three foot by four foot windows for my church, Chapel by the Sea, which you are welcome to stop by to see anytime. They are lit artificially from behind but in these photos you can see how natural light is wonderful behind this art medium too. Learn step-by-step how to master this medium! Some have described watercolor as the most difficult of mediums to master, but it is so much fun when you learn the techniques in a step-by-step way and use quality paints, brushes and paper. Using acrylic enamels students turn ordinary tiles into miniature paintings that are ready to hang on the wall. Composition, perspective, values and color are all explored as these paintings come to life. Go wild with detail with Pitt pens and watercolor! This is a great class for those of us who love to get into fine details! You will learn to create texture with many different techniques and perspective by just varying the thickness of your lines. When you add the watercolor washes you can see a whole different dimension to your picture! What do YOU see in a rock! Using acrylic paint students learn how to turn common rocks into little sculptures. In the process they learn how to make shadows recede and turn flat surfaces into 3 dimensional shapes to create animals, houses and anything else that they can imagine that rock could become! Learn to use the proper tools needed to create your own earrings, necklaces and bracelets with my extensive collection of beads! You will be surprised at the professional results you can get with a little practice! A wonderful world of colored papers! Using papers painted here at the studio and hand made papers from all over the world you will learn how to create pictures with many different textures. It is amazing what students have done with a pair of scissors, glue and paper over the years in my collage classes! Besides a new appreciation for this medium you will develop a love for the beautiful papers you can create and purchase which have endless creative possibilities! Sort of like chalk but way more beautiful! Using good quality materials makes such a big difference in art and this is especially noticeable with soft pastels. You will love the way they blend with just a touch of the finger! Learn the importance of the color wheel while you also explore how to use the right values to make your paintings really come alive. SO much more fun and creamy than those old crayons! Often simply called "pastels", oil pastels are very different than soft pastels so it is good to know the difference. You will learn how to masterfully blend these creamy pastels sticks to create the many textures you'll find in the subject matter you choose to work from. Learn all about the color wheel and how it is used to help you mix just the right hue. You will also learn all about the importance of value in a painting, and that's just the beginning! Draw, transfer, carve then print! Block Printing is a wonderfully satisfying medium for anyone who loves to work through a step-by-step process. Your original drawing, after transferring it to the printing block, is then carefully carved into a graphic image you can then print as many times as you wish for just that many original works of art! More blocks are then carved for additional colors. My students love this process! Beads and wire turn into all kinds of creatures! Bugs, frogs, bumblebees and many other creatures can be made with simple stringing techniques using beads and wire! Get creative with a needle, thread and some seed beads! It's amazing how many ways seed beads can be used to create everything from necklaces to purses! There are so many different stitches that even kids as young as 10 can learn. Even painting with only one color is fun! Using just one color, such as Sepia or Payne's Grey, you can learn all of the watercolor techniques you'll need to feel confident before using a full palette and at the same time achieve wonderful results. Charcoal drawing is messy but fun! 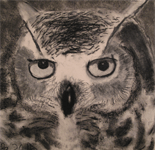 I offer charcoal drawing classes on every new schedule because learning to see values without worrying about color is a great way to introduce students as young as 6 to the world of art! Besides that, it is really fun! Make 3D sculptures of wool! Needle felted posable animals are made with wool, wrapped and felted with special barbed felting needles around a wire armature. Needle felt pictures of soft wool! 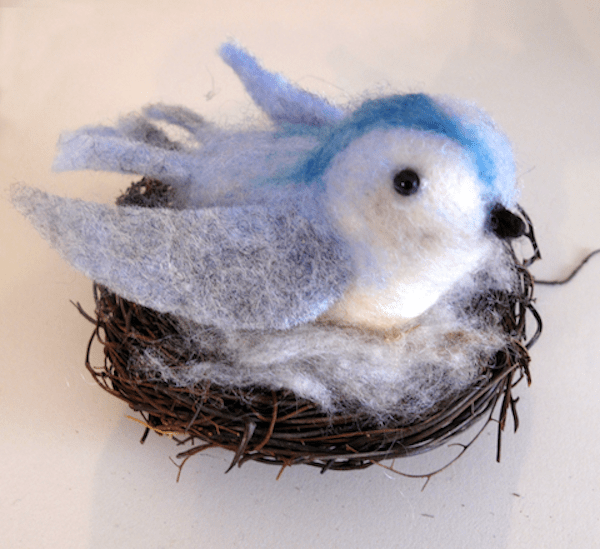 Needle felted pictures are created with soft wool of different kinds and many colors by using a special barbed needle that binds the wool fibers together when repeatedly poked. Hover your mouse over the testimonials below to read them or tap your smartphone screen. On your smartphone, to continue the thread hit your back button and then return to this page again. "My 10 year old daughter has loved taking Betty's art classes every summer. It's become an annual tradition. The artwork they create is amazing! The classes fill up quickly so don't delay once you get the schedule."